The discovery phase of any litigation is performed by the attorneys in a case, often assisted by paralegals and legal assistants. It is necessary to enlist the help of these legal professionals in order to handle the sheer volume of work and organization that is necessary. Today much of discovery can be electronic. E-discovery is the term used meaning to locate and produce evidence that is in electronic form. While the definition is simple, the subject is more complex. The ways in which e-discovery is conducted changes rapidly as our technologies and media forms change. It is necessary for any legal professionals involved in litigation to stay current on the latest news and changes in e-discovery. Attorney and professional writer Jon Dawson gives a broad overview of types of e-discovery. The article emphasizes how e-discovery software can help you manage the different types of discovery you may be required to produce. Lynn Frances, a legal technology analyst and consultant, writes about how e-discovery was conducted historically, and how it is changing. Frances writes about a new trend in handling e-discovery that mixes old with new. The Discovery Advocate blog is presented by members of Baker Hostetler’s E-Discovery Advocacy and Management Team and takes a practical look at modern discovery practice and the developments and trends that impact today’s litigants in the trenches of litigation. Employees of Clearwell Systems, an e-discovery software company, discuss e-discovery issues, trends and news, including recent court cases. 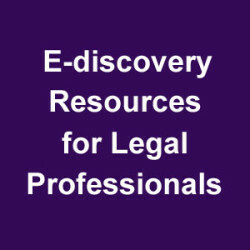 News and information about e-discovery, providing information and resources to help attorneys, technicians, litigation support professionals, records and information managers tame the chaos of e-discovery. This blog aims to build awareness and provide practical tips for readers to take their legal strategy to the next level. The requirements of paralegals and legal assistants today are ever-changing, especially those involved in litigation. The internet is an invaluable resource to provide new and current information on e-discovery. Staying current will be a great help to you and your team of attorneys in your next litigated matter. Susan Kay is a Co-Founder and Co-Owner of Brown & Jones Reporting, Inc. Connect with her on LinkedIn and Google+. This entry was posted on Wednesday, March 5th, 2014 at 8:00 am	and is filed under All Posts. You can follow any responses to this entry through the RSS 2.0 feed. You can skip to the end and leave a response. Pinging is currently not allowed.